Many bird species are in decline in their stock or even endangered. Play fatal shock on overhead lines and collisions a large role. In resting and pulling areas accidents up to 700 birds per year and line kilometers. 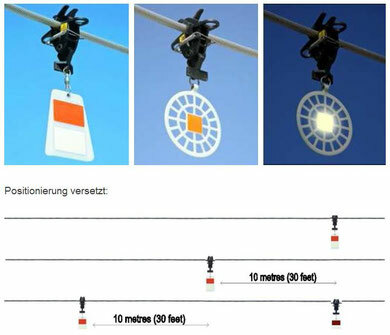 But it can be done a lot to overhead lines to make bird safer. An electric shock is usually performed by a ground fault caused by bridging of live conductors and earthed components (mast). The greatest danger is from medium voltage lines. In these lines, the phase shifts are small, so that the birds settling can cause a short circuit or ground fault. Particularly dangerous are headframes with upstanding insulators (pin insulators). In high-voltage lines, the distances between the phase conductors and the drooping Isolierketten contrast is so great that no short-circuit danger. 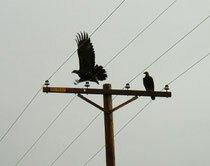 Low-voltage pylons also pose no great danger, because the feathers protect birds from electric shocks at low voltages. Dieter Haas, Bernd Schürenberg: Electrocution of birds: "Principles and Standards for the protection of birds on overhead lines"
GEO: "Nature conservation analysis of coastal power lines"
Birds covers protect birds from contact with live conductors. Spacers can prevent birds can come close to the current carrying conductors. Dangle poles (at least 600mm down). For large birds (storks and large birds of prey) should be at least 750mm pure isolation track. Birds marks should be selected whenever the sensitivity of birds has higher priority than the landscape. The markings reduce bird strike up to 90%. Acoustic bird control systems play saved from bird calls of birds of prey and warning cries of endangered species. They are mounted on poles in a sufficient amount. Some models can be powered by a solar panel. Go one step further camera systems that are constantly directed upwards. You recognize birds and automatically activate the acoustic defense system only if the bird falls below a minimum distance to the power line. Characterized the noise is reduced by the acoustic equipment to a minimum. Also, the habit of the birds on the signals can be effectively prevented.